Hate losing toys in the grass? The Little Green Bean is a colorful dog toy that is easily seen on snow, water, land and in the shadows. This durable toy squeaks, floats and is machine washable. 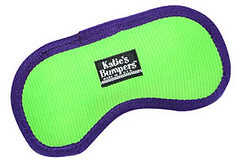 The Little Green Bean was recently featured in Real Simple Magazine’s Best New Pet Gear. There is also an orange and purple version called Jilly Bean. These beans won’t result in extra gas. This entry was posted on Wednesday, June 13th, 2007 at 3:52 am	and is filed under Dogs, National Dog, Cat & Pet Info, Products & Services for Cats & Dogs. You can follow any responses to this entry through the RSS 2.0 feed. Both comments and pings are currently closed.